Good morning — thanks for clicking on this email and joining us! Since we have started this little “email ministry”, we have been so pleasantly surprised and grateful for your kind reception and enthusiasm for it! What started as a small idea, to make Jesus and His Mother known and loved, has grown into something much bigger. Praise the Holy Spirit for His inspiration! Many of you have mentioned that you like to sit and drink coffee while you read it and forward it to your family and friends. That’s exactly what we were envisioning and hoping for – just a simple way to share good Catholic stuff with the people we love. So, thank you for being a part of this! May Our Lady, Cause of Our Joy, plant many seeds of love for her Son through all of us! As you know, we are heading into the most holy week of the year, aptly named Holy Week. Cause of Our Joy will be focused on our preparation for this incredible time, when we draw near to the Most lovable and humble Heart of Jesus as He prepares to die for us. So, without further ado, let’s get into this! Tomorrow is Palm Sunday–also called Passion Sunday– (the readings can be found here) where we remember Jesus’ triumphant entry into Jerusalem. The crowds hailed Him as a King and people laid down their cloaks and waved palm branches to welcome Him. Not even a week later, many of these same people would be yelling “Crucify him!” What a turn around. 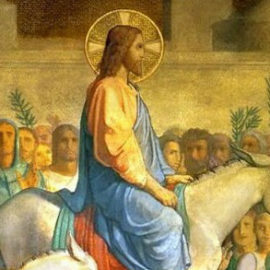 Scott Hahn has a wonderful reflection which can be found hereand this article from Jimmy Akin, 9 Things You Need to Know About Palm Sunday, gives a lot of background to this historic event. Ever wonder what you can do with the palms that you bring home from Mass on Palm Sunday? Here is a link with 10 ideas. The Chrism Mass is also celebrated during Holy Week. In the Diocese of Gaylord, the Mass will be on Tuesday, April 16, at 11:00 am at the Cathedral. During this Mass the bishop blesses the sacramental oils to be used throughout his diocese for the coming year. This article from Catholic Exchange explains what happens at this Mass and its historical significance. Those Catholic Men also have a great article explaining why the Chrism Mass is so important. Spy Wednesday is generally not as well known as the other days in Holy Week. 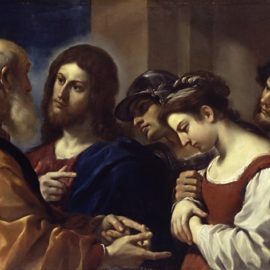 The day before Jesus is betrayed, Judas meets with the chief priests to make a deal to betray Him for 30 pieces of silver. This day is called spy Wednesday in reference to the ‘spy’ or ‘traitor’ —Judas. This simple piece from Aleteia explains it well. Holy Thursday begins the Triduum each year. It is the last Mass celebrated until the Easter Vigil. Holy Thursday is steeped in tradition and full of symbolism. If you have ever participated in a Seder Meal, you have experienced the incredible ties from the Old Testament Passover to the New Testament Last Supper. At this supper, Jesus institutes the Eucharist and the priesthood, and humbly washes the feet of His disciples. 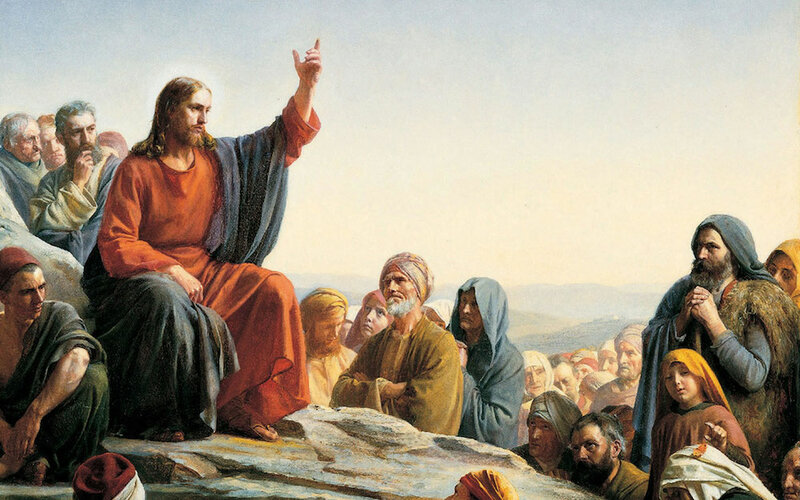 This article from Catholic News Agency sums it up well and this article from National Catholic Register gives some great, lesser-known information about Holy Thursday. If you have children at home, this Holy Thursday craft is a great and is a nice way to talk about the events of that day. Many folks have seen Mel Gibson’s The Passion of the Christ and can still remember their visceral reactions to seeing the brutality which Jesus endured. Or, maybe you have sheepishly whispered “Crucify him!” during the Good Friday service because the thought of saying those words out loud seemed barbaric. After repeated exposure and time, however, it’s not uncommon to get used to it, to become dulled or desensitized to what Jesus went through. We don’t like to admit it, but the events of Good Friday have the potential to become almost routine if we don’t remind ourselves about what really happened. This article speaks to this beautifully and is very helpful. Wondering how to observe Good Friday with your children? This linkhas some great, practical ideas. Lori’s favorite Good Friday activity to do with the kids is the Scriptural Lunch (found in the link above). She has done if for years with her children, and it’s very adaptable. It is such a tangible and memorable way to reinforce the Passion and Death of Jesus. Her kids ask for it every year. For most of us, fasting and abstaining from meat is pretty difficult. (As a reminder, the guidelines are here.) We aren’t used to intentionally going without something we want or need. Oftentimes, this sort of sacrifice can be met with feelings of frustration or exhaustion. This piece offers an excellent outlook on fasting and abstaining and it really reset our minds and inspired us as we draw near to Good Friday! When we think about Our Lady during Holy Week, it’s hard not to wonder how she made it through. Seeing her Son suffer as He did had to be some of the worst suffering a human has ever endured. The Sorrowful Mother understands our suffering too. This beautiful article delves into Our Lady’s heart as she witnessed the heartbreaking events of Good Friday. Don’t forget to start the Divine Mercy novena on Good Friday. A link to the prayers can be found here! 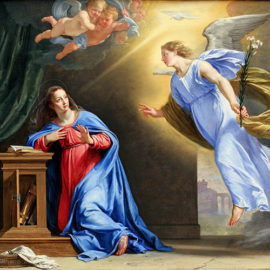 Before we let you go, we wanted to give you one more nifty resource!Three Ways to Gain a Plenary Indulgence Before Easter is a great way to prepare for the resurrection of Our Lord. P.P.S. Join us for a community potluck on Friday, April 26 to celebrate the Resurrection of Our Lord. We start with a Rosary at 5:30 p.m., followed with dinner and family-friendly activities. P.P.S. And join us Saturday, May 4 from 9:30-11:30 to learn how to plant a Mary Garden. P.P.P.S. Please forward this email to friends and encourage them to sign up for our email newsletter. Support the Marian Center with your gift! ©2019 Marian Center in Joy Valley. All rights reserved.